This post continues the retelling of my recent trip to Belize: participating in an archaeology field school and learning about jaguar conservation. The remainder of this series is located in the Travel category of this blog. The names of some individuals in this post have been changed to respect their privacy. Following yesterday’s unexpected lab day, on June 11, 2017 I returned to the field. This time I was stationed at Pretty Group, a site I first described here. When we arrived at Pretty Group, my first task was to clean and close a unit (rectangular area) that we had been excavating. I swept up the loose dirt, measured how far down we had dug, and photographed the unit. Next, it was time to start backfilling. 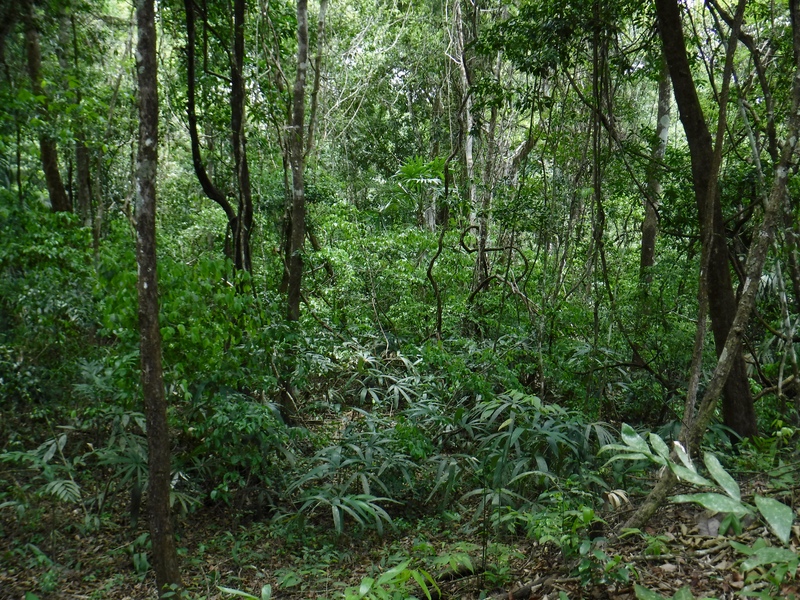 Some of the vegetation near Pretty Group. I cannot share pictures of the active archaeological digs I worked at, to protect them from looters. The Programme for Belize Archaeological Project was organized into two sessions. The first session, when most of the excavating took place, was coming to a close. We thus had to backfill our units. I was assigned to backfill an old unit with one of our Belizean workers, Fernando. We started by laying a tarp across the bottom of the unit, on top of which we shoveled dirt and leafy debris. This was my first time working with Fernando, but we got along well. Fernando did not speak much English, but he was patient with my clumsy Spanish. After Fernando and I had finished backfilling the old unit, I had to help our site leader profile the unit she had been excavating. This is the same unit that produced the large Mayan bowl I wrote about earlier. Profiling was tedious work. We first planted two stakes at opposite ends of the back wall of the unit. We then tied a string between the stakes, which was suspended a few centimeters above the ground. Next, one of us stretched a measuring tape along the string. The other person took a sharpie and marked the string at 10 cm intervals. Now we were ready to start profiling. A rudimentary sketch from my field journal of the unit we profiled, with some markups. 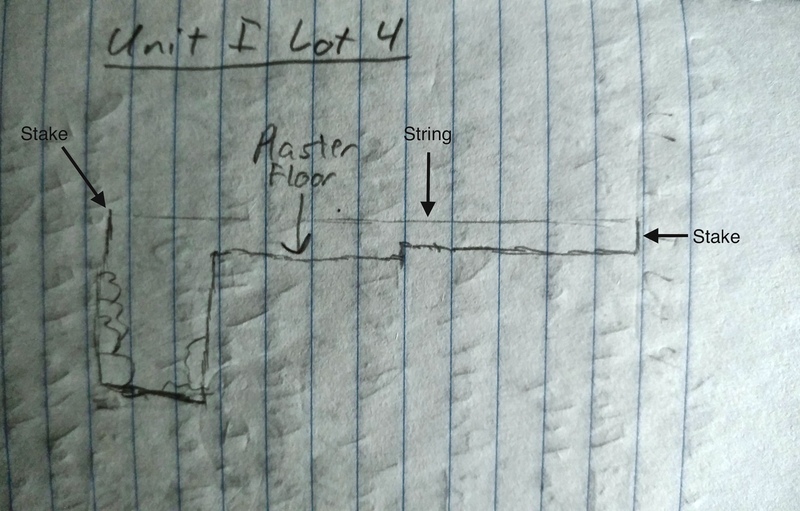 A “lot” refers to a specific level within a unit. So “Unit I Lot 4” means, “Unit I, fourth level.” This labeling system helped us to keep track of where everything was found. One of us entered the unit, while the other remained topside. The person inside the unit took measurements at various depths. Using a measuring tape, they first assessed the distance between the string and the ground. They then checked to see how far down the humus (topsoil) layer was. They proceeded to measure points of interest (e.g. 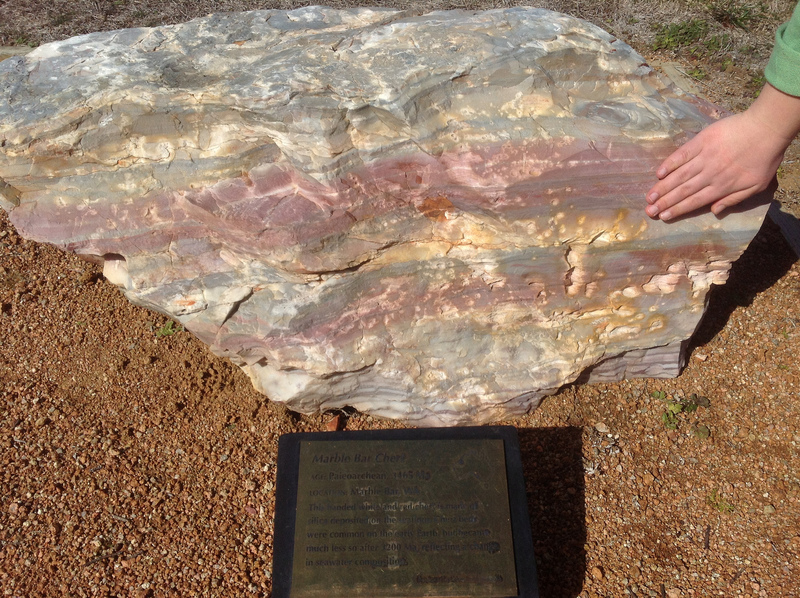 changes in soil type or the beginnings of human-made floors) until they had reached the bottom of the unit. The person in the unit read each number aloud. The other individual recorded each measurement by making a dot on a graph. This process was repeated for each 10 cm interval along the wall of the unit. As they proceeded, the recorder connected the dots on the graph. The end result was a precise and accurate map of the unit. I understood the value of profiling, but for me it was a chore. Fortunately, my next task was more to my liking. I was assigned to help Fernando backfill the unit we had just profiled. However, this backfilling job was infinitely more fun than the first. This is because it involved moving large rocks. We protected the unit’s floor by laying down a tarp, which we covered with soft dirt. Fernando and I then threw large rocks into the unit, trying to carry as many as we could in each load. Some of the other Belizean workers joined us, and the task turned into organized chaos. It was delightful. Our hike out that afternoon proved most interesting. By now, the three-mile trek to the road had become routine. But not today. I questioned Fernando, and he said that the dead animal we both smelled was a jaguar kill. When I relayed this information to the rest of our group, they became visibly distressed. 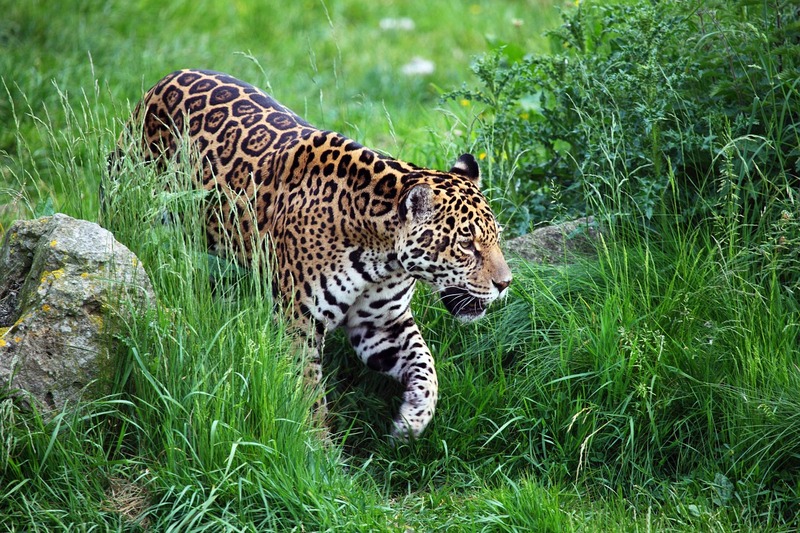 Jaguars are hardly ever aggressive towards humans, but disturbing one at its kill is not wise. I told everyone that we would be fine if we just kept walking. We were a loud group, and our chances of surprising the cat were virtually zero. Sure enough, no one got mauled by a jaguar that day. What I did not tell my companions was that I really wanted to see that jaguar – if it was indeed there. While that did not happen, it is exciting to know that I was potentially within metres of a wild jaguar. How neat. We used Chert on our farm roads in Alabama. It’s real common, low dust and cost effective, especially in rural areas. I had never heard of it before then. I had never heard of chert before going to Belize! It seems like it has many uses. I’d never heard of it before then either. I like it, it keeps the area more rural, which is nice in its own way. christian. But through their artifacts, I learned that was contrary to their origins. In fact, it was their pottery that provided a glimpse into the Moche civilization. So glad we connected on here. Many people in Latin America are Catholic now, but that religion was forced on them…sometimes violently. Indigenous peoples throughout the Americas had their own cosmologies and systems of belief before peaceful Christians “saved” them through military conquest. I probably shouldn’t have said that out loud. Oh, and about the Spanish. You don’t need to know much Spanish in Belize, since most people there can speak a fair amount of English (it was a British colony for many years). So you’d get by just fine! But I was mostly working with people who had roots in Guatemala, so it was much more important for me to know Spanish. I’m definitely not fluent in it though, and since I returned to the states I haven’t been using it nearly enough. Amazing stuff! You’re engaged in important work, Josh! Wow what an incredible job you have, I found this post really interesting! Thanks Emma! It actually wasn’t my job: I just joined the archaeology field school because I wanted to learn about archaeology. It was really interesting! Ooh okay, sorry I got the wrong impression, that’s still such an awesome experience though! No problem! It was my fault for not adequately explaining what I was doing in Belize. It certainly was an awesome experience. After looking at your blog though, it’s clear that you’ve had plenty of awesome experiences too! How fortunate that you’re able to do so much traveling at a young age. Yes I have been so fortunate and I hope to do even more travel this year! What a nice Job you have Josh… so adventurous! Would love to read more from you! As a mom of two I really do not get much time but I would like to read more such stuff! Hi Shivangi! Thanks so much for visiting my blog! I’m incredibly fortunate to have been able to perform this archaeological work in Belize. However, I should clarify that I’m not a professional archaeologist: I was in Belize learning about archaeology through an archaeological field school. I’m sorry for not being more clear in my post! I understand that you must be busy! But feel free to “visit” whenever you want! Indiana Jones is a classic series of movies about an archaeology professor. He runs around the world punching Nazis. Unfortunately I didn’t get to punch any Nazis while I was doing archaeological work, because they all live in the US now. I almost died choking on my biscuits with that last line. 😂 You have to warn people before you say these things! Lives are at stake! Allow me to summarize the plot of the two Indiana Jones movies I’ve seen (Raiders of the Lost Ark and The Last Crusade). Unassuming college professor with perfectly-chiseled jaw is presented with an opportunity to look for artifacts of central importance to Christians. He transforms into a cowboy whom women can’t resist and runs around the world fighting Nazis and running away from snakes. When all hope seems lost, he somehow manages to remove the Christian artifacts from the Nazis’ grasp. Despite my highly satirical summary, they really are entertaining movies; definitely worth a watch. [If you’re chewing something right now you might want to stop]. I sometimes wonder if future scholars will watch Indiana Jones for insight into a period when Nazis were regarded as bad in the US. You don’t have Nazis in Jamaica, and you have the world’s best coffee? If I had a beard I’d be stroking it thoughtfully right now. Should I have warned you about that line too? I’m going to say yes, it counts as manslaughter, but since I had a few warnings this time, I think you’re legally covered! The plot sounds similar to Dan Brown’s books, minus the Nazis. I should probably check out this perfectly chiseled jaw myself though… and see what it’s all about. Never been a big fan of cowboys, but since women have not been able to resist, maybe I’ll get sucked into it anyway! Stop stroking your imaginary beard and book your ticket – haha! I’ve never read Dan Brown’s books, but Indiana Jones is probably better: less thinking and more punching. I WILL go to Jamaica some day, but I probably shouldn’t take any more big trips until after I finish my degree. Otherwise I’ll be confined by the shackles of academia forever. You’re not missing much with Dan Brown. He’s great at constructing puzzles, and mystery, but not the best at actually writing. I also found a few tinges of racism and ethnic fetishizing in his works. So Indiana Jones probably is better. That’s probably wise, as long as you eventually do make it to Jamaica. You’ll love it!